Teen Wolf is back on DVD with Season 3b and it just keeps getting better. When MTV decided to give the show an extended season rather than watering down what they had, they split the season into A and B, which was a brilliant move. This season's tagline was Lose Your Mind, and it was definitely a psychological thriller. Three weeks after the events of Season 3A, 3B starts and hits the ground running. While there are a few funny moments this season may be the darkest one yet. The season kicks off side effects from 3As ritual sacrifice bring about illicit nightmares from Stiles, Scott and Allison right from the start before the season dives into Japanese mythology and the introduction of supernatural creatures such as the Kitsune, oni and nogitsune. Derek's whereabouts and reasons for leaving are discovered and explored. Scott learns control of his alphaness, Lydia's powers are mastered. Stiles must make hard decisions. One thing is for sure, nothing and no one will be same after this season. The writers really stepped up their game making Stiles, the best character in my opinion thanks to Dylan O'Brien's amazingness, into the villain, and took some chances by killing off a major character. It's an emotional punch right to the gut with all the horror and heartbreak. Everyone really pulled their weight this season delivering some of the best performances of the series. My normally favorite special feature is absent from the DVD. The lack of the Sirtless montage is a travesty. 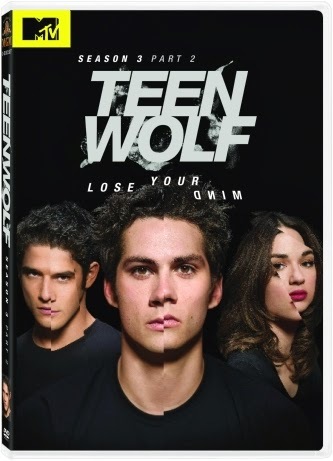 The only special feature is "Following the Pack: The Fans of Teen Wolf." Which includes special footage from the Supernatural Fan Expo with cast interviews, exclusive party coverage and more. With season four having just started, there's no time like the present to get caught up. Teen Wolf Season 3 part 2 is on DVD now!